Instead of doing a usual unboxing video of May Fab Bag, I thought of doing something better that you would find more useful. So, this is what I did. Check out the video and in case, you’re a person who likes to read, scroll down. The subscription service is getting popular day by day in India, especially among women (the service is for both the genders). As I haven’t tried the men’s fab bag for obvious reasons, I won’t be able to give much information about men’s fab bag so, guys this might not be the article you wanna read unless you are looking for something for your lady love. Okay, so this review is going to be in 2 parts. 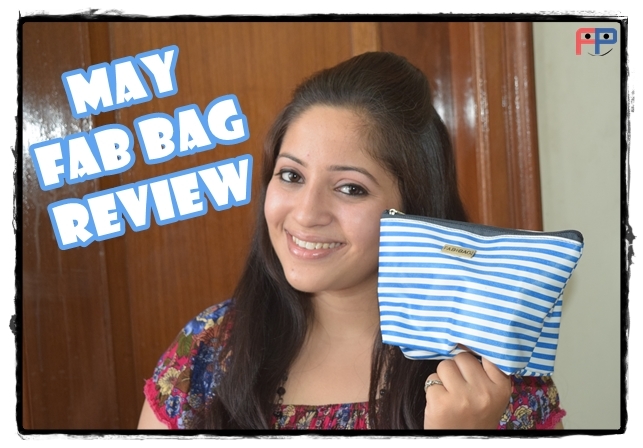 1st I am gonna show you what’s in this May Fab Bag 2015 and I am also gonna review the products I got in that fab bag. And I am going to tell you about my experience with this service so that you can find out if you should invest your time & money in it or not. I hope this article would be helpful for you. So let’s get started. Before that, subscribe to my newsletter for sure because I really want to talk to you again which is most likely to happen only if you subscribe and let me email you. This is how the May Fab Bag looks like. White bag with blue stripes and looks like they’re also keeping track of fashion trends along with the newly launched beauty products. The feel you get by touching this bag is awesome. I love it. Without further delay, let’s see what’s in it. What’s in May Fab Bag 2015? Apart from my personalized card that has all details of what I got along with the quantity and price details, there’s a fab bag magazine which has a DIY mud mask recipe, DIY distressed jeans and a how-to on getting beach bum waves without heat. Nice tips and I am gonna try them all and share on instagram (@finix_post) for sure. The magazine has lots of other cool stuff and beauty picks but these three that I mentioned, were the ones I liked. 1st thing I got is Be A Bombshell lip gloss (shade: taupeless) and this is so good. It’s like lip products are just not meant for me for they just don’t stay on my lips for long. But this is the second product that I have got from fab bag that stays on my lips for a few hours and trust me! If it stays on my lips for hours, it is one of the best lips products in the market. This one has a cool (though the shade is actually warm/fruity but it’s cool 😛 ) shade and also smells really good and of course, it is tasty. But after you take it off, your lips tend to get dry so better keep a lip balm handy. 2nd thing is afterglow face cleanser and it is like one of the best ones I have ever tried. The moment I put it on my face and massaged it, I could see the glow. And that’s literally not possible if you ask the beauty experts because it does take some time for the glow to be visible but this one is definitely quick. And it smells so good. Also, the ingredients are chemical free and really good for skin. 3rd thing i got is Vana Vidhi rice scrub which smells like food. And the only reason why I would ever say that I hate it is because I am trying to lose weight. No thoughts about food allowed. 4th thing I got is a scarf of blue color and I have one of pink color as well that was also sent by fab bag last year. And as usual, the scarf is simple and stylish just like I prefer. So, if it you ask about may fab bag, u must order it now. It is super awesome. Should You Get A Fab Bag Subscription? Let’s talk about Fab Bag in general. So what happens with fab bag service is that you put an order for a bag that costs from 400-600 Rs. depending upon the subscription period. I have a 6 month subscription so I got it for 450 Rs. Once you place the order, you fill a one time questionnaire telling Fab bag people about your preferences when it comes to beauty and skincare products. You can also make changes which you would need if you have a skin like mine which keeps changing. Weird! The products which you get are of course a surprise but they’re highly customized. I have got like 6-7 fab bags and I have never got a product which didn’t suit my skin type or my usual preferences. In fact, I was planning a fab bag favourites video and it was like I wanted to include all the products, seriously! That means I loved roughly 20 out 24 products. That is really good. So, I think if you are a person who loves beauty products or just likes to pamper himself or herself, you need a fab bag. And I bet if you try it once, you would want to try it again… and again and again… so get it for yourself but before that, let me know if you found this review helpful. Previous articleImportance of Perception And why you must challenge your thoughts? Next articleWhy You Should Eat Chocolates Everyday? Anyway it was really fun to read your reviews. Kindly contact us, to discuss in-detail. Thank you in advance.